Like a sordid, grocery-store pulp novel that's just too much fun to put down, Drew Goddard's Bad Times at the El Royale provides a wickedly good time with the latest accommodations at an affordable stay, offering the sort of guilty pleasure without the guilt. Bad times end in violence on Ultra HD with an excellent 4K HDR10 presentation and a fantastic Dolby Atmos soundtrack, making it a nice improvement over the Blu-ray. Sadly, a lackluster selection of supplements makes this an average UHD package, only worth a look for loyal fans. 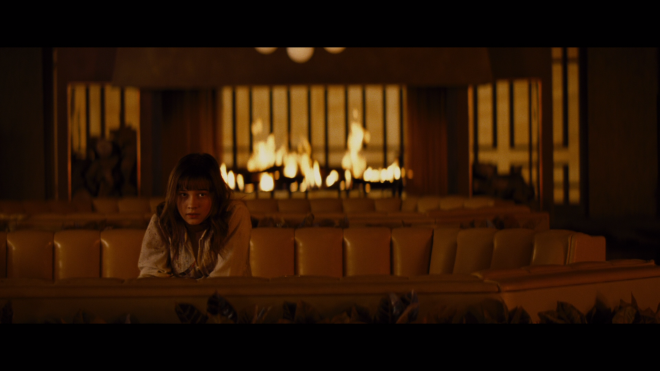 Even after a couple of days of deliberating, I'm still not sure what to think of Bad Times at the El Royale. And that's actually meant as a compliment because the characters, story, and visuals continue to linger in the back of the mind long after the movie is over, yet it left me wondering what the heck I just watched or if there was even a point to the violent absurdity. Much like the titular motel, the whole fiasco is extravagantly decorated, made to look as though more intricate and elaborate — from the stage design, costuming and imaginative camerawork — than it really is. The El Royale still maintains some semblance of its genteel glory days, but upon closer inspection, the place feels cheap and vacant. Again, this is not to disparage what writer/director Drew Goddard and his production have accomplished. For in its simplicity, we are given a straightforward, undemanding tale that's wildly entertaining and memorable, a deliciously wicked story of happenstance engrossed in vintage elegance. And that in itself is perhaps Goddard's point — to simply be a good time at a cool place, but for one night, it's neither cool nor a good time. The neo-noir crime thriller is a reminder that not every movie needs to be enjoyed from some intellectual perspective or that every story must progress towards a momentous, climactic revelation that affects the protagonist in a deeply meaningful way. All the characters' motives and intentions are made pretty clear and blatant as they arrive at the motel and while they don't share their secrets with one another, they each remain relatively the same person as when they checked in. Jeff Bridges' priest arrives with a determined purpose, as though looking for something but always with an air of unsureness and doubt. Cynthia Erivo's soulful singer Darlene is similarly balancing a hope for a more successful future with a great deal of hesitancy and lack of confidence while also running away from her past. It's no wonder these two soon bond and form close ties. The same pretty much goes for the rest of the ensemble cast. 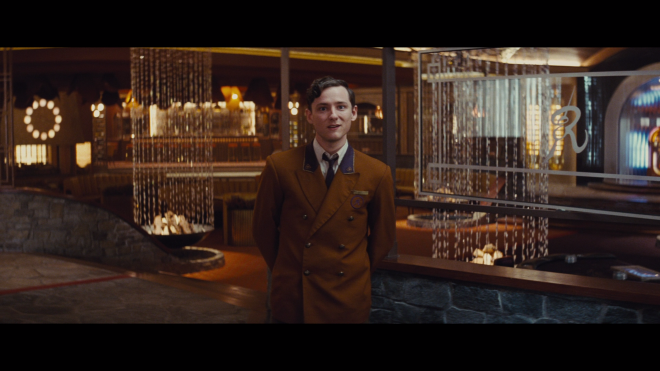 However, a case could be made for the motel's concierge Miles Miller (Lewis Pullman) as perhaps the most innocent of the bunch, a seemingly timid and reluctant young man who squirms at the sight of the violence suddenly erupting around. Yet, there's a sense he's carrying a great deal on his shoulders, weighed down by the secrets of others while hoping for release from them. Meanwhile, Jon Hamm's traveling salesman plays the Southern gentleman to the point of maddening since he's so convincingly rude and entitled in his search to maintain secrets and introduce the MacGuffin. At the same time, sisters Emily and Rose Summerspring (Dakota Johnson and Cailee Spaeny) amplify the tension and general air of unease by inviting the terrifying charms of cult leader Billy Lee (an awesome Chris Hemsworth). Each of these people is in search of something, mostly hope, opportunity, and absolution, but they go about obtaining those elusive abstracts through morally-questionable and outright sinful deeds. In El Royale, the plot plays out like a series of completely random events that somehow also feel fated to have happened. The gods are playing a deadly game of roulette with the lives of these strangers — wretched, lonely souls who have coincidentally converged at a once celebrated and ultra-hip motel. Where there was once life and celebration, there is now death and despair on this cold, rainy night. And Goddard does an excellent job at turning the preordained escapade into one cool, happening occasion. The crime thriller blends the unpredictable mystery of Identity with the suspense of Psycho while oozing in the sinister beauty of classic noir and as if it were told by Quentin Tarantino. The film doesn't strive to be anything more than what it actually is, reminiscent of the sordid pulp novels from decades ago, the sort we find tempting us to purchase at the check-out aisle of the grocery store. We're supposed to feel guilty for enjoying this kind of trashy material, but such guilty pleasures are so much fun not to revel in their enjoyment. 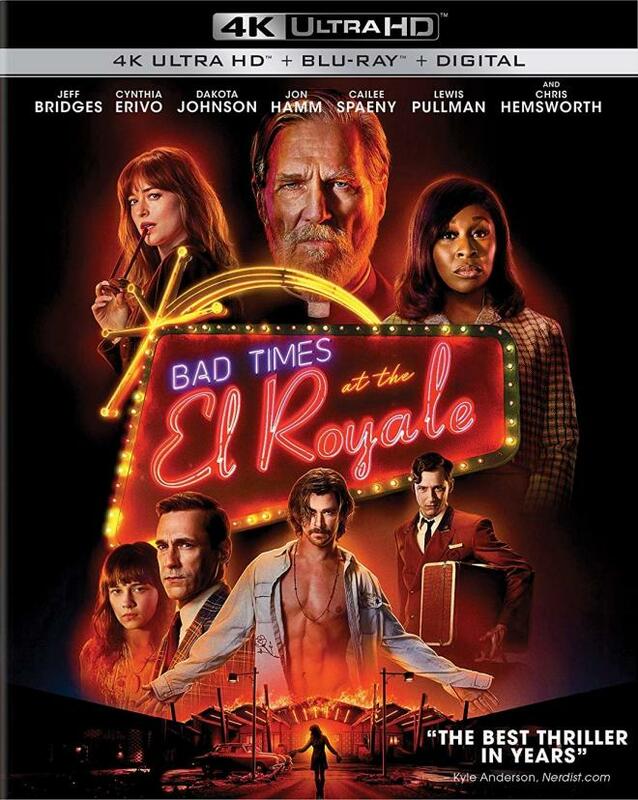 20th Century Fox Home Entertainment brings Bad Times at the El Royale to Ultra HD Blu-ray as a two-disc combo pack with a flyer for a Digital Copy. Said code can be redeemed via FoxDigitalMovies and Movies Anywhere, unlocking the 4K HDR10 version with Dolby Digital Plus 5.1 audio on various streaming formats. With a glossy cardboard slipcover, the dual-layered UHD66 disc sits comfortably opposite a Region Free, BD50 disc inside a black, eco-cutout keepcase. At startup, the UHD goes straight to the main menu screen with full-motion clips, the usual options along the bottom and music playing in the background. Bad times come to a sudden and violent clash on Ultra HD packing a fully-loaded and ultimately lovely HEVC H.265 encode, showcasing a few welcomed improvements over the Blu-ray. Shot on traditional 35mm film, which was later mastered to a 4K DI, the freshly-minted 2160p transfer checks into the motel with a welcomed uptick in overall definition. 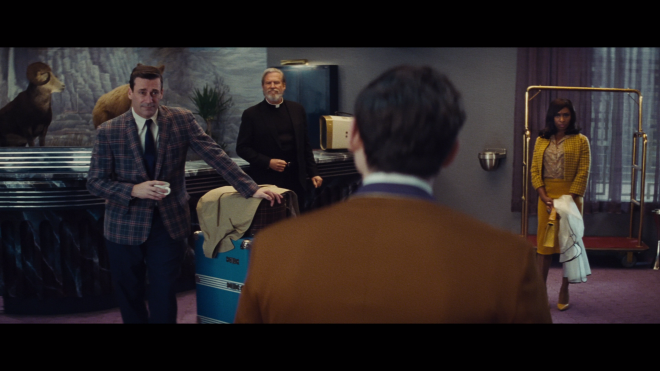 Honestly, the difference may be small, but there's a bit more clarity in the background information where we can better make out the tiniest object and elaborate feature decorating the walls and rooms of the El Royale. The unique design and pattern of the wallpaper is more detailed, the stitching and threading in the clothing and in the fabric of the furniture is more distinct, and the smallest imperfection of the otherwise clean and ornate lodge is plainly visible. Awash in a very fine layer of natural gain, the UHD picture has a lovely film-like quality with excellent detailing throughout. Interestingly, contrast doesn't appear to show a dramatic difference, which is likely the result of the filmmaker's artistic intentions. Nevertheless, the modest improvement is enough for cleaner, slightly brighter whites that energize the explosive action. However, the creative photography benefits significantly in the specular highlights, giving the hotter, more intense spots a narrower, tighter glow and notably better detailing within those areas. We can see this best when the sun shines through the curtains of windows and either the fabric of those said curtains or the objects outside the window are made more apparent compared to the Blu-ray. Black levels are also a tad inkier with a slightly more ominous feel, bathing the bizarre story with a sense of dread and horror lurking everywhere while providing the 2.39:1 image with a lovely cinematic quality. Shadow details remain about the same, which is good as it maintains strong visibility and excellent dimensionality. The neo-noir thriller erupts into action with an outstanding Dolby Atmos soundtrack that terrifically enhances its already-fantastic DTS-HD counterpart. Imaging is splendid expansive and spacious, displaying superb acoustical detailing, sharply-defined highs and distinct, room-penetrating mids. The soundstage is continuously kept busy with plenty of off-screen activity that effectively travels between three front channels and into the top heights, generating a convincingly and highly engaging half-dome wall of sound. Benefitting from the extra breathing, the musical score and song selections reveal plenty of warmth and fidelity with distinct clarity between each note and instrumentation while also subtly bleeding into the heights and surrounds. Amid the mayhem, vocal remain precise and well-prioritized. Although it never hits ultra-low depths, the low-end is nicely responsive and palpable, providing the rumbling boom of thunder and the music with wall-rattling impact and presence. The same set of supplements are ported over from the Blu-ray. Making Bad Times at the El Royale (HD, 29 min): A short documentary with cast & crew interviews talking about the production, but mainly focused on its style and design. Although the film lingers in the back of the mind long after it is over, Bad Times at the El Royale leaves one wondering what the heck they just watched or if the violent absurdity even serves any purpose. In the end, Drew Goddard's neo-noir crime thriller is a reminder not every movie needs to be watched with some intellectual curiosity, but it can be simply enjoyed like a sordid, grocery-story pulp novel that's too much fun to put down. Bad times end in violence on Ultra HD with an excellent 4K HDR10 presentation that offers a welcomed upgrade over the Blu-ray and a fantastic Dolby Atmos soundtrack that terrifically improves upon its DTS-HD counterpart. Sadly, a terribly lackluster selection of supplements make for a rather average UHD package and really only Worth a Look for loyal fans.